Died 16 April 1917 aged 29yrs. Son of William and Eva North, 6 Caiach Terrace, Trelewis. William North is commemorated on the Trelewis war Memorial. From the start of my research on this site, I could not locate William North, despite having information from the War Memorial at Llanfabon Church showing him to belong to the “R.I.Fus”. I now believe that this may be incorrectly copied. Information supplied at the time may have been written as “A.I.F” and then wrongly recorded as “R.I.F” and later modified to R.I.Fus. I cannot happily match any W North from the R.I.Fus with this person, and with further information (as below) I do not believe William joined any British Battalion first. A Merthyr Express news article of May 13th, 1916 supports this suggestion. William Henry North was born in June 1887 at Highbridge, Somerset. He was the eldest son of William and Eva North who, in 1901, lived at 3 Cottage Road, Burnham on Sea, Somerset which is just over a mile away from Highbridge. Cottage Road may now be what is labelled as Cottage Row. William (Snr) was born in about 1865 at Ilton, Somerset, while Eva was born in about 1868. Grace Mead North, born 1898 at Highbridge. Also living with them at this address was a Charlotte Viner whos is shown as Eva’s sister. William (Snr) is not on the report. Charlotte Mary North was born in 1902 while the family still lived in Somerset. Ronald James North, born in 1908. The 1911 Census report shows a 3 month old child, Eva Mary living at this address, and is the grand-daughter of William and Eva. 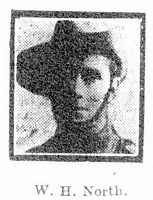 Taken from the newspaper article below, William Henry North emigrated to Australia in about 1912, and in March 1916, he enlisted in the 1st Battalion, Australian Imperial Forces, a battalion of volunteers. Mary, born 1919; Leo, born 1920 and Frances, born 1923. His sister Charlotte married a Stanley Frazer in 1923 at Pontypridd. They appear only to have had one child, Duncan, born in 1924. Another brother, Ronald, married Bronwen Evans in 1936 at Merthyr Tydfil. He had a distinguishing feature of a scar above the buttocks. He enlisted into the 20th Regiment, 1st Battalion and was assigned to “B” Company, though the recommendation by the approving officer, Lieutenant H.J. Godfrey, was for him to join “C” Company. He enlisted at Victoria Barracks, Sydney, Australia. His enlistment papers showed that he had previously served in the 3rd Welsh Volunteer Regiment, but had resigned after 2 years. His occupation was shown as ‘labourer’. His movement papers show that he left Sydney, Australia on 9th September 1916 and arrived at Plymouth on 26th October 1916. From there, he was taken to Fovant, a small village near Salisbury, Wiltshire, where he undertook further training. On 8th December 1916 he was ‘Marched In’ as part of the 1st (Training) Battalion. Then, on 4th February 1917, he went to Folkestone, where he travelled on the S.S. Victoria to France. On 7th February 1917 he joined his unit at Etaples, France and on 16th February he was taken ‘into the field’. His records show that he was ‘Killed in Action’ on 16th April, 1917, having been in the field for two months exactly. The records also show that he was buried ‘in the vicinity of Hermies’. Hermies is a village only a few miles from Moeuvres where he is buried. Among his military records there is a document which shows that on 22nd February, 1917, William signed his will, leaving everything to his mother Eva. Mr & Mrs W North, 6 Caiach Terrace, Trelewis have been officially notified that their son, Private W.H. North, of the Australian Imperial Forces was killed in action in France in March. North emigrated to Australia about five years ago and joined the Force in March of last year, completing his training on Salisbury Plain. He was home on four days leave in December last, after which, the family did not see him again prior to his going to France. Notice of his death was received from the Australian records office. Private North was employed as a railway clerk in Australia and before emigrating, worked at the Deep Navigation pit, Treharris. This brings the roll of Nelson soldiers killed in action up to nineteen.